Hannah Cremona will not be home for Christmas. 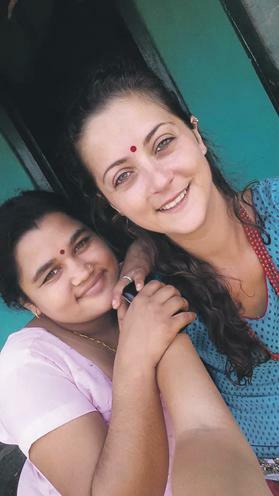 Instead, she bought a one-way ticket to the Himalayas, she tells Melanie Vella. Hannah Cremona, bottom right, with other volunteers. As Hannah Cremona’s first Christmas away from her family in Malta, she is lucky enough to spend it in a place she considers her second home. In October, Hannah travelled to Nepal for the third time, with no return ticket. “I’m currently volunteering at Maya Universe Academy in the Tanahun district,” she says. “Tanahun is located at the foot of the Himalayas. Here, in rural Nepal, most of the people who live in the villages depend on farming for their livelihoods. Life is very simple, with limited access to basic amenities like sanitation, education and safe drinking water. Hannah Cremona with a local shop owner during the Dashain festival. The Maya Universe Academy is a social entrepreneurship project providing quality free education for the villages’ children as well as another 20 children from other villages. Instead of paying for their children’s school fees, parents dedicate time to the project. Cremona is currently leading the sales and marketing efforts for the Maya’s poultry farm. “The chicken farm was built and set up using donations from Maltese. The profits generated will sustain a food programme, which I started in April 2014. Over 100 students receive fresh eggs three times a week. In response to the earthquake that shook Nepal last April, Maya built a larger hostel and will soon host over 25 children from Gorkha, a district which was devastated by the earthquake. “Right now, life in Nepal can be challenging,” Cremona says. “While everyone is trying to move on and repair the damages caused by the earthquake, we are now suffering a fuel shortage. This makes it difficult to travel around Nepal. Many families do not have gas in their homes. Supplies imported from India, including daily commodities and chicken feed, are running out. Over the past two years, Cremona has spent five months in Nepal. “Last Christmas, I woke up feeling a great sadness knowing that I will be consuming copious amounts of food and exchanging fancy gifts, while people in Nepal were suffering. Even though I’m grateful for what I have, this year I decided to return to Nepal in October and spend Christmas here. I wanted to share what I have and give what I can to the children at Maya. “Hindu is the main religion among the Nepali people. However, everyone is tolerant towards other religions and the harmony is quite unique. There is a small Christian community close to our village. Some Korean friends are building a small church too. I plan to celebrate Christmas with these families who live and work with us at Maya Universe Academy. The children have never heard of Father Christmas. I would like to make this day a little special for them this year. “Christmas celebrations here are not about buying gifts but about spending time with loved ones. We are planning to collect a little money from each volunteer to buy small gifts for the children and volunteers who live at the hostel. We will exchange them on Christmas morning while enjoying tea and cookies. Still, Cremona will miss spending Christmas in Malta.